Let’s be clear: it was a story designed to happen. However, last year I was flying from Istanbul to Tehran as this competition was shaping its course. Down Mureş. This year, it somehow felt right: the team [Andra, Dan, Iulia, Marcel, and I], the boat [in spite of a bit of soap opera related to it and some finishing touches right before the start], the time frame [24-26.04.2015]. Considering the ‘as-busy-as-a-bee’ lives of all our team members, we went for an early wake up [+drive] to Sălard on the competition day. To this point – registration included –, it all went smoothly, with most of our friends made on water eager to see us. The cute green T-shirts in our hands, we headed to our cars and then to get the keys to our accommodation [Casa Cerbu, 78 EUR/night], a very welcoming chalet conveniently located 1 minute away from the river. Equipped and ready for action [the mini-wafers had been quite a useful energy boost and addition to our stacks of food purchased the day before], we headed to Meştera Village, where the boat needed inflating and we needed extra helmets and safety jackets. Although the latter had been pre-booked, some of the guys [volunteers, I trust] at the rental location were clearly overwhelmed and I started to panic seeing the equipment vanish before my very eyes. Romanian, Hungarian... it wasn’t working out. That is until the organiser saved me (us). Heading back to the guys and the boat, we had clearly stumbled upon another problem: Dan’s car was stuck in a (hidden) swampy terrain. The unsuccessful attempts to take it out were revenged by the kindness of our competitors, who settled it in the end. More internal organisational-wise drama followed, as – amongst others – our boat deflated and the guys had to pump up during the countdown to the start (and the related discourses). We were turtles to the water and consequently far behind the other teams, as the big boats were the first to hit Mureş. 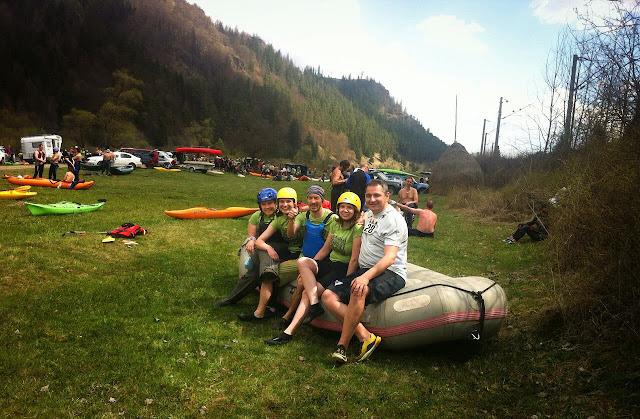 It was our first time rafting in Romania and our first time rafting without a professional skipper. The water level wasn’t high at all and my hopes for it to increase in the second half of the route [total length: 24 km] were shattered, in the end. We had work to do. Motivated and high on chocolate, it was easier during the first half and we even had our half an hour of glory, on third place! Of course, it was expected, with the girls paddling conscientiously in the middle line, Marcel steering the boat, and Dan screaming eagerly at me every chance he’d get. To paddle, obviously. And then followed the first big rock that kept us busy untrapping the boat for precious minutes. The boats behind us got ahead and our team morale got lower. And the nasty clouds started to pour rain down on us [again, the first time rafting in the rain], with vicious gusts plotting against us-- ‘O să îmi ţin casca pe cap, cred că ţine cald la urechi.’ (‘I’ll keep my helmet on, it might help warm my ears.’) (Andra). We were eagerly waiting for the check point, as we continued to lose speed and be unable to tackle the boulders. It was our chance, as I perceived it, to get ahead again, without taking unnecessary breaks. Yet I was never aware or informed that the stop was mandatory. I mean, c’mon, what’s the point in stopping for water [in plastic cups, eyes rollin’] or chocolate when we had plenty inside our boat? Plus, when I compete, I don’t rest. Of course, we lost A LOT of time only going back to pick up the water and the chocolate, lost a paddle, had to get it back from the water, got stuck on a boulder... so on and so forth. I believe that I was entitled to scream off the top of my lungs ‘Fi-v-ar checkpointu’’ [that was roughly swearing to be settled with the checkpoint, which I started to dread from that point on :)]. And then, the way was paved with boulders down. Down to the finish line. We got stuck too many times, had to get out of the boat and push it. Half of the team got really demotivated and almost stopped paddling altogether, with Marcel desperately yelling ‘Haide, Dan!’ [‘C’mon, Dan!’] from the other end of the boat. Similarly to our national football team, we started to find reasons for lagging so far behind. One of them was that there were spectators tricking us that we’d reached the finish line. Eventually, we did. I felt disappointed, because I knew that we could have done better. It felt cold and wet and in the end, after a short dinner and some much-appreciated help to get at least one car back, we got to the chalet, skipping the award ceremony and planning to return for the party. Tired and unkeen on driving back to Răstoliţa, there were proposals to just go, stay there for half an hour and head back to turn in. Dan, clearly not thrilled by this idea ironically murmured ‘Cam aşa ziceam şi io.’ [‘My thoughts precisely.’]. In the end, we stayed in and had a few drinks, snacks, and games and went to bed. The next morning’s sunshine, laughter and the quality stops at Tg. Mureş and Sighişoara took the pressure off the previous day. And topped it up with a better vibe. Our team will hold on to it: this was only the beginning of an adventure-filled spring/summer! As Iulia would put it in the end, ‘Mmm... da!’ [‘Hell, yeah!’].